Java continues to be Public Enemy No. 1 when it comes to computer and network security. Oracle released a huge update for the virtually ubiquitous software, but attackers aren't done exploiting Java as the weakest link in the security chain, and Oracle isn't securing it fast enough. The update is impressive in scope and scale, and it's important for IT admins and users to apply it as soon as possible. Amol Sarwate, director of Qualys Vulnerability Labs, notes in a blog post, "All vulnerabilities except three can be exploited remotely by an attacker, and in most cases, the attacker can take complete control of the system." Lamar Bailey, director of security research and development for Tripwire, has dubbed 2013 "the year of the Java vulnerability." Bailey points out that Java is widely used across multiple platforms, and that alone makes it a juicy target for attackers. "Java is squarely in the crosshairs of many hackers and security researchers and that's not going to change in the short term." 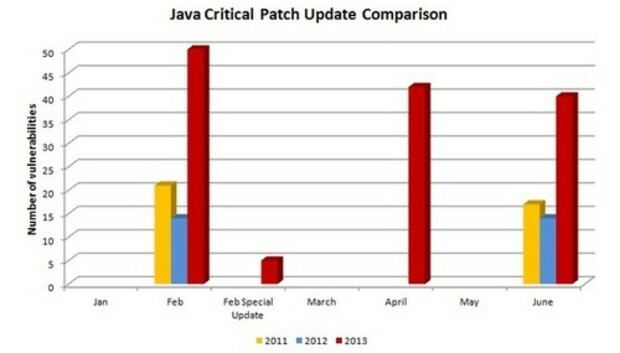 Sarwate also highlights the dramatic spike in Java vulnerabilities with a chart comparing the rate of Java vulnerabilities over the last three years. Sarwate says, "This year we had 137 vulnerabilities as compared to just 28 and 38 during the same period for the last two years." The bullseye on Java's back, and Oracle's oft-lethargic reaction time in patching known vulnerabilities, has led many companies and vendors to disable Java, or to even seek out alternatives to replace it. Apple has turned off Java by default in Safari, and Microsoft released a Fix-It tool that lets users disable Java in Internet Explorer. Bailey points out, "Even though Oracle is doing a decent job of stepping up their delivery of bug fixes they still have a long way to go," adding, "I hope Oracle has a 'full court press' on Java security so they can squash the remaining vulnerabilities relatively quickly." For starters, Oracle should abandon the quarterly update model. There are simply too many Java vulnerabilities, discovered too frequently to expect businesses or users to sit idly--exposed to potential attacks against known flaws--for months before a patch is available. Oracle should follow Microsoft's example and get on the monthly Patch Tuesday bandwagon, or risk seeing the Java exodus accelerate.